The birth of twin pandas at a research center brought the number of the endangered species born in captivity this year in China to a record 25. The twins, both weighing about 5.5 ounces, were born September 6 at the Wolong Giant Panda Protection and Research Center in the southwestern province of Sichuan. 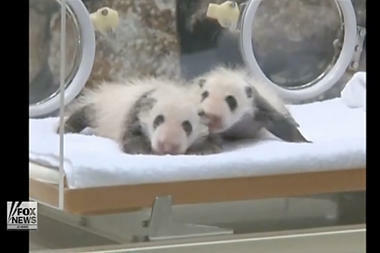 The as-yet-unnamed cubs were the first for their 8-year-old mother Youyou, the report said. The bears are the sixth set of twins born to captive pandas this year—a sign of the growing success of China’s extensive breeding program, which relies heavily on artificial insemination, Chinese researchers say.